After the Watergate scandal taught Richard Nixon the consequences of recording White House conversations none of his successors has dared to do it. But Nixon wasn't the first. 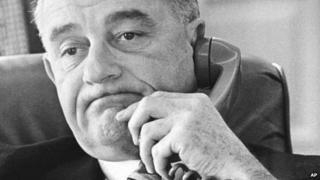 Media captionPresident Lyndon B Johnson: How can we survive as a nation and face lies from the press? Listen to the Archive On 4 programme: Wheeler: The Final Word, on BBC Radio 4 at 20.00 GMT on Saturday or for seven days afterwards on the BBC iPlayer.